Today I have with me the fantastic Sheila A. Nielson, upcoming debut author of the book Forbidden Sea. I'll have my review of her book up later this afternoon. As a former children's librarian, how do you think working in such an environment has affected you as a writer? I feel that being a librarian has affected my writing a great deal. The reason I chose to write a mermaid story in the first place is because so many children were coming into the library asking for mermaid books and we had very few to offer them. Even now, I find myself trying to think up future stories on subjects the library has a lot of need for. Talking to kids day in and day out also helped me to see the kinds of things they like, especially in the books they choose to read. What was the inspiration behind your novel Forbidden Sea? Because there were so few mermaid books available, I knew I wanted to write one, but didn't quite know where to start. I had another story I'd been thinking of writing, but it had a lot of plot problems–and no mermaid. Once I added the mermaid, the story just fell into place like magic. Figuring out what the merfolk would be like in my story was probably the best part of writing Forbidden Sea. As a very young child, I had loved the idea of mermaids but didn't like the way they were portrayed in traditional mythology. I used to imagine up all sorts of things about what I thought mermaids SHOULD be like. I ended up returning to these childhood ideas to create the merfolk in my story. 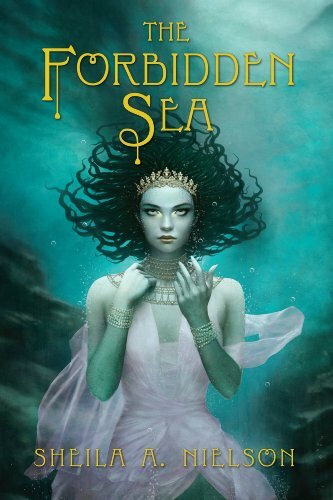 Is Forbidden Sea a stand-a-lone novel or will there be more forthcoming? What type of research did you do when writing Forbidden Sea? I had to do all kinds of historical research while writing this book. Especially about what people once believed about mermaids many years ago. The people of the Orkney Islands have a well documented history when it comes to believing in merfolk. Much of my research came from studying their history and historical records of actual mermaid sightings that were once reported by fishermen. I also happened to have a very dear librarian friend who can research what a dog kennel was like in the late 1800's without batting an eyelash. I owe much of my book's obscure details of daily life to her awesome research skills. What can I say–librarians ROCK! Anything else you would like to tell your readers? There would be no authors if there weren't readers, so thanks to all of you for giving this author a chance to share her story. And thank you, Kristen, for inviting me to be on your fabulous blog! Thank you Sheila for taking time out to answer my questions! That’s awesome! Librarian authors are my favorite! And it’s true, there are so few mermaid books available, it’s really quite sad. WOW! This is truly amazing! When I saw your accompanying blog image come up in my Reading List (<– the blog's I follow), I thought you're entry was going to be about actress JUNE "Baby June" HAVOC (who is in today's NEWS, having just passed away.) She and your Miss Sheila A. Nielson bear a striking resemblance to each other! Great interview! I really want this one. It sounds good! FAB interview. I can not wait to read this one. I love when people take action when they see a need, good for her. And shout out to all the librarians (yay, I am one too) they really can be pathways to great books. What’s up, I wish for to subscribe for this web site to obtain most up-to-date updates, therefore where can i do it please assist.